Blepharoplasty, or eyelid surgery, can fix bags, dark circles, droopy eyelids, and tear trough concerns. Dr. Yaremchuk employs several techniques in his eyelid surgeries to restore youthful contour and dimensions to the eyelids. The late medical anthropologist Leslie Farkas documented that the typical youthful eye among a large sample of young North American women had a narrow appearance, upward tilt from the inner to outer aspect, and short lower lid. Illustration of Dr. Farkas’ measurements of the youthful eye with narrow fissure, upward tilt and short lower lid. As the eye ages, it takes on a rounder appearance as gravity takes effect and supporting tissues relax over time. Instead of creating the desired youthful effect, too often conventional blepharoplasty techniques exaggerate the aged appearance by resulting in a post-op “round eye” look. Dr. Yaremchuk employs a variety of innovative techniques depending on the clinical situation. These techniques include the transconjunctival approach with arcus marginalis release and fat redistribution as opposed to excision, selective use of lateral canthopexy, skeletal augmentation and midface elevation. Dr. Yaremchuk has presented and written extensively about these techniques in scholarly articles, book chapters, and lectures. The tear trough deformity is a challenging problem. It is often associated with "dark circles." Most often, Dr. Yaremchuk corrects the tear trough deformity using the transconjunctival arcus marginalis release with fat transposition. For severe deformities, he employs both the transconjunctival arcus marginalis release with fat transposition and a tear trough implant. The video here shows Dr. Yaremchuk's technique for correcting a severe tear trough deformity. Patients with prominent eyes have long been known to be predisposed to complications after lower lid blepharoplasty. 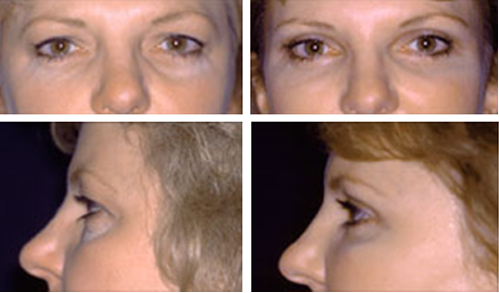 Dr Yaremchuk has developed techniques to improve the appearance of the lower lids in patients with prominent eyes. Eyes appear overly prominent because the upper midface skeleton (the bone directly beneath the eye) lacks projection. Without a projecting skeleton to support it, the lower lid and cheek tissues tend to fall, making the eyes prominent. Dr Yaremchuk treats this problem building up the skeleton with an infraorbital implant and performing a midface lift to elevate the cheek and lower lid tissues on the new, projecting skeletal framework. Blepharoplasty for prominent eyes: The illustration shows cross section lateral views of the orbit taken at the level of the pupil. The diagram on the left shows the average relations of the lower lid and globe. The middle illustration depicts a prominent eye due to lack of projection of the skeleton and the subsequent descent of the lower lid and cheek. On the far right, the bone has been augmented with an infraorbital rim implant and the cheek and lid elevated (subperiosteal midface lift). Note how the lid margin rests higher on the globe making the eye appear less prominent. Dr. Yaremchuk also performs revisional blepharoplasty to correct unfortunate results for patients who underwent prior unsatisfactory blepharoplasty procedures elsewhere. Dr. Yaremchuk has shared his face and eyelid rejuvenation techniques with plastic surgeons in live surgery demonstrations around the world including Spain, Germany, Russia, Argentina and Taiwan. He has demonstrated his blepharoplasty and skeletal augmentation surgery at the Canadian Society for Aesthetic Plastic Surgery Annual Meeting and at the Annual Atlanta Oculoplastic Symposium. * This Asian patient underwent upper and lower lid blepharoplasty. * This patient underwent transconjunctival blepharoplasty with arcus marginalis release and fat transposition.